Were I to play the new Warhammer 40K Planet Strike with my Tau army, then I'd have to create a proper attacking force. 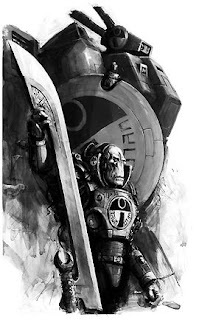 So to make the most of the 6 Elite slots granted to the Planet Strike attacker, it would have to be a 30 Tau Battlesuit army, led by none other than Commander Farsight. And if I had any points left, they'd all be leaping out of the exit hatch of a low flying Tau Manta. This kind of imagery inspired by Planet Strike really makes you drool doesn't it? Of course, that's until you add up the dizzying cost of a proper Warhammer 40K Planet Strike army. So I'm going to let my imagination run a little wild with this and create an army list based around whatever mental imagery the concept of Planet Strike conjures up. But, is that army playable and can I win games with it having thrown all sense of balance and tactical reason out of the window? 7 Tau Battlesuit bodyguards all armed with plasma rifle, missile pod, multi tracker, targeting array and drone controller with 2 shield drones. That comes to 2961 points. At 12 pounds sterling per model, it would cost 348 pounds. How would it play? Probably quite well, although Fusion Blasters are needed for anything with armour 14. Cheers, found this from your "How to Win at Warhammer 40K" blog. I'd suggest making the suit team leaders carry a plasma/fusion combo and target lock (IIRC) so that they can target tanks while the rest of the squad can go after light tanks or medium/heavy infantry. Also, I've had good luck with the burst cannon/cyclic ion blaster combo with multi tracker on my Shas'o as the rather murderous amount of fire he pours tends to cause light and medium infantry to melt. I think I'm an aberrant Tau player because I don't go suit heavy, and actually prefer massive squads of drones to mess up my opponents and to screen my forces. Considering their initiative, they're the best counter attackers in the Tau army. I do plan on picking up some fish at some point though, just to make my squads a bit more mobile, but will be running max squad size for the most firepower possible. @EL PEE: Drones are not good units. Trust me on this. and it's only Shield Drones which have Initiative 4. I used to run a 12 man firewarrior squad in a Devilfish. Very expensive and didn't do a lot more than the 6 man squad. Have a read of my Carnage Battle Reports for some army ideas. 6 battlesuit teams; nearly 350 quid; those numbers are scary. I do think it would perform very well though. And very straightforwardly as well. Neat idea! "sounds good but you should add some vespid"